Venue location: Deauville Hotel 6701 Collins Avenue Miami Beach, FL. The Beatles were not the top billing for this show, Mitzi Gaynor was. The Beatles were paid $3,500 for this appearance. An estimated 70 million viewers in 22,445,000 households saw this live performance. The songs performed were: 'She Loves You', 'This Boy', 'All My Loving', 'I Saw Her Standing There', 'From Me to You' and 'I Want to Hold Your Hand'. 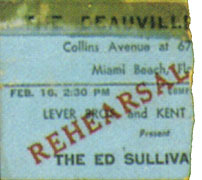 The Deauville is still in business as the Radisson Deauville Resort in Miami Beach. Only one known ticket stub has surfaced thus far and it is for the dress rehearsal at 2:30pm on February 16th. 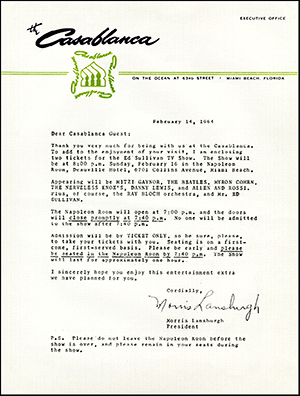 Recently, several vintage letters have surfaced that were distributed within various Miami hotels to hotel guests. 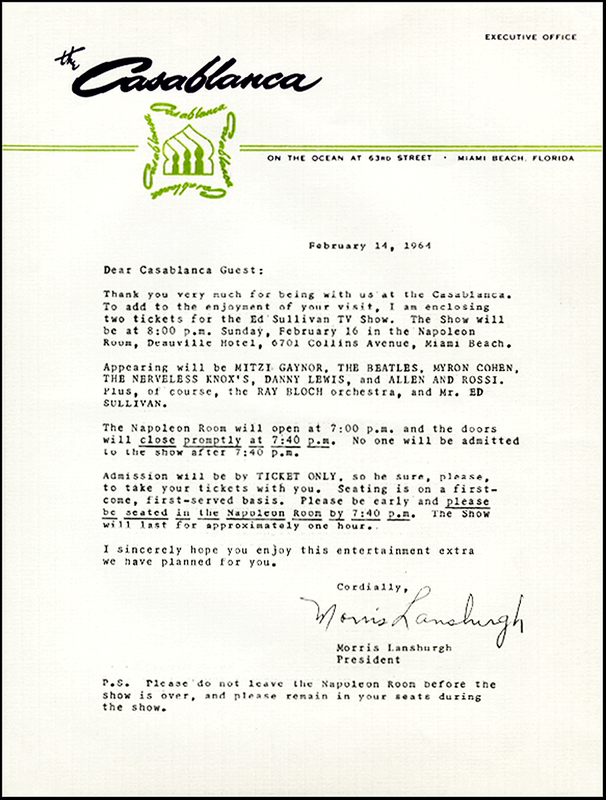 The letters essentially explain that there are complimentary tickets available to attend the Ed Sullivan broadcast. Guest letter from the Casablanca hotel offering two complimentary tickets to their guests for the main show at 8:00pm. The Versailles hotel also offered free tickets, but for the dress rehearsal. Click for enlargement.